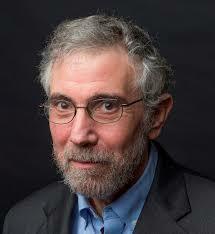 Lesson 17 in Paul Krugman's Masterclass is 14 minutes and 28 seconds long. In this class, Krugman takes us through a brief history of recent China and then proceed to a generally sound discussion of trade and tariffs. The most remarkable thing is that Krugman does not single out in any detail of the economic collapse of Mao's communist China. 40 years of looking inward by China. He then makes an important point against central planning but I don't think that is his goal. It appears he is just suggesting that the boom period after Mao was haphazard. There weren't a whole lot of effective government interventions [during the period]. He then provides an interesting current day fact. The Pearl River Delta which stretches from Guangdong to Hong Kong. The manufacturing workshop of the world. Then Krugman goes on to discuss trade policy, while barely hiding his disgust for President Trump. a trade war will make things worse, not better. He then notes that tariffs on steel and aluminum are particularly counterproductive because they are not direct consumer goods and hurt manufacturers. He notes that steel is used by the auto manufacturing industry so by putting tariffs on steel, it makes the auto industry less competitive. Krugman then touches on trade deficits (and taking another justified swipe at Trump). He says, sounding like Murray Rothbard, that trade deficits don't matter, which is correct. And says that the rhetoric needs to be cooled down. He then makes the odd claim, without explaining it, that the overall trade balance could be a problem. He then rants against Trump's tax cut but not from the sound perspective that given that spending isn't cut, simultaneously with the tax cut, the government is just sucking the money out of the economy some other way. Rather, he just appears to be against corporate tax cuts. He then discusses China and intellectual property theft from a statist position as though the state should be managing these battles. And comes pretty close to taking the position of Trump and his adviser Peter Navarro. [C]onsider the White House screed against China written apparently by Peter Navarro and released a few weeks ago called "How China's Economic Aggression Threatens the Technologies and Intellectual Property of the United States and the World". That unhinged exercise in anti-Chinese bellicosity was testimony to sheer economic ignorance and a nasty form of Big Government nationalism---not any valid issues about bilateral trade with China. ".....reverse engineering in China is widespread and entails the process of disassembling (products).... for the purpose of cloning something similar without authorization from the rights holder.....(which) is illegal when the unauthorized production is of technology under patent or other protection." Goodness me. Illegal patent infringement is exactly why more than 7,000 patent cases are filed in the US court system each year. The Chinese are not good guys. Well, I for one I am a lot more concerned about Krugman's generally bad economic policy advice then I am about what the Chinese are doing. So take that Paulie. This lesson, in short, is a very mixed bag. Krugman does make some sound points so I am not going to flunk him on this lesson but the seriousness of his errors when he goes off the tracks are so extreme that I can't do any better than to give him a D+.